The Kurdish government in Iraq announced Wednesday it would resume oil exports from the region later this week. Erbil had shut down exports in April, blaming the central government in Baghdad for withholding payments owed to international oil companies working in the semi-autonomous north. The region's Ministry of Natural Resources said the resumption was a goodwill gesture meant to encourage the central government to settle the outstanding payments. With foreign companies seemingly focusing their financial energy in northern Iraq, however, the gesture may be more of a power play than a confidence-building effort. Iraq, more than seven years after the first post-Saddam government was voted in, still lacks effective legislation to govern the oil sector. The central government in Baghdad considers unilateral oil contracts with the Kurdistan Regional Government illegal. U.S. supermajors Chevron Corp. and Exxon Mobil were blacklisted by Baghdad for making deals with Kurdish authorities. In April, the Kurdish government retaliated by blocking oil exports but has since sent some shipments over the border to Turkey. Despite the political infighting, French major Total and Marathon Oil locked step in the Kurdish north. Total, in a statement, said it was looking for "new opportunities" in Iraq. That move brought additional fire from Baghdad. A spokesman for the energy ministry said the central government would "punish" companies that made deals without Baghdad's consent, warning Total it could face "severe consequences" for its actions. Nevertheless, the Kurdish Ministry of Natural Resources said the government in Erbil persuaded international oil companies to restart exports at 100,000 barrels per day later this week. 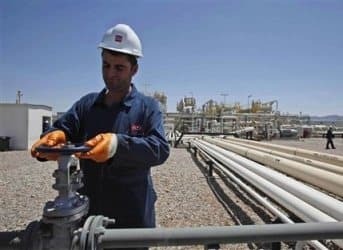 "This is a goodwill initiative and we sincerely hope that the federal authorities in Iraq respond positively, making all the outstanding payments due to the international oil companies and implementing all the measures agreed upon between the KRG and the federal government," a spokesman said in a statement. Exports could "move swiftly" up to 200,000 bpd if payments were made quickly, the spokesman added. Kurdish Natural Resources Minister Ashti Hawrami, for his part, said now was the time to settle the "futile and time-wasting" effort aimed at reinstating what he said was the "illegal centralized control over oil and gas in Iraq." His comments highlight the broader political divisions straining Iraqi unity in the post-invasion environment. A report from the International Crisis Group highlights the oil dispute as one of the factors undermining Iraqi development. An earlier report published after the export boycott in April states that the Kurds were "accelerating the centrifugal forces that are tearing at the Iraqi fabric" by pressing their luck with oil and territory. But if international investment trends are any indication, it appears that, with frustration growing over Iraqi Prime Minister Nouri al-Maliki's grip on power, it's the Kurds that are holding the aces.